Question: We are going to have an international convention soon in which we will celebrate the publication of The Book of Zohar adapted to the new generation. What does this mean? Answer: By working with this book we are aware, understand, and feel that we have a source of power that belongs to the upper nature, to the force that manages everything to the smallest detail, to the smallest cell, to the last atom. The Book of Zohar has a special quality that allows us to connect to this force and to be inspired by it. Thus we will be able to understand and feel it and work according to it. We have no other key or connecting channel, other than The Book of Zohar. All the other Kabbalah books were actually written so that we would approach the main book and use it correctly. So we celebrate the publication of Zohar For All. We have to understand that we are on the verge of a new era, moving on to a level of a new development. We have to disseminate this book all over the world, and produce many other supplementary materials that will serve to bring people closer to it. Question: The friends are trying to convince me to change my opinion and agree with the group. This upsets me because I forgive them their mistakes and am ready to continue our path together with them. Why don’t they admit that I may have an opinion different from the group? It is unpleasant. Answer: Of course, it’s unpleasant. Tomorrow, the friends may come to you and say that the group has decided to wear the same uniform: a clown hat and waistcoat, one half blue and the other red. What would you say? It’s not some kind of a rational argument about what path to take where opinions are divided and both parts include many people. So you could agree with any of them, and in any case you must not follow the opinion of society: one or the other, if not with the “communists,” then with the “capitalists.” There is no problem because society accepts both. But what if tomorrow the group tells you something that generally is not accepted in society? You say that you cannot walk around in a clown hat, then what can you do? It’s impossible that some are wearing caps and others are without them; the group should be homogeneous. My actions must get closer to the goal. If according to Baal HaSulam, the goal requires such a path, then we will have to do it. Comment: I would continue to be your friend but without a cap! Answer: But then you are not a friend to us. The word “friend” (Haver in Hebrew) comes from the world “connection” (Chibur). If you do not agree with us, then you cannot be our friend. As unreservedly as you accept the duty to walk around in a clown cap, you have to accept the duty to disseminate integral education. In general, this should not be a question for you. There is a mentor who decides, and this mentor is not me but Baal HaSulam. I just explain his ideas and we should just carry them out. If a person does not do that, then why should he be with us and waste time? He will gain nothing because he goes with us only where his egoism allows him. 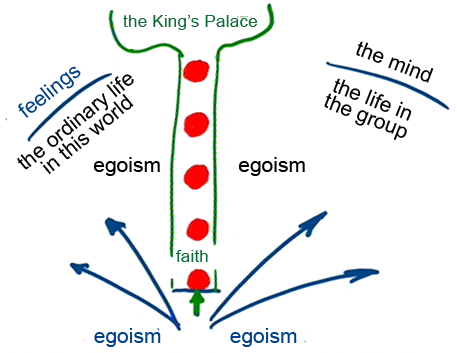 As soon as egoism protests and it’s necessary to advance a bit above reason, he cannot overcome this. I do not disregard these people because they have a strong opinion. If they conquer its resistance, they will make good progress. But if they do not conquer it, they will just be a nuisance for everyone else. This is drilling a hole in the shared boat. Thus, they have no place in our boat of mutual guarantee. The path is built from a set of points, each of which does not stand out from the rest, but is connected with the previous and the next. Thus, together they form a line. Only in this way will this trail take you to the entrance to the royal palace. In everything else where your egoism reigns, on the left and on the right sides of the path, you can agree with the group. But all this does not belong to the spiritual path. You only need these disputed points from everything that there is in front of you. Therefore, Baal HaSulam writes that he is glad that sinners are revealed. It would not be possible to advance without this revelation. Precisely it’s the revealed sinners that come to the holiness of the day. Due to the Light that sanctifies the path, you suddenly see obstacles in front of you and rejoice in their revelation. I am therefore delighted to see how these sinners are revealed in the students, because without this, they would have nothing to work on. If you do not want this work, you can go to a different place, the religion of Hasidism. There, you would not be required to overcome in faith above reason, and you would just study. Here, you will not manage without the power of the group and the force of the Creator in order to attract the Light that Reforms. You are obliged to stand with friends around Mount Sinai, the mountain of hatred, and despite it, desire to unite. This is the condition of receiving the Torah, the Reforming Light that shines from the top of the mountain. Question: The spiritual path goes only through points of friction where I disagree with the teacher and the group. How can I agree if I see that you are wrong? Answer: Of course you see that the teacher is wrong. You also think that the Creator is wrong in having arranged this tough life in this world for us. Couldn’t He have made it peaceful, pleasurable, and serene? This step is always above your reason, where the next stage is. Everything else with which you agree—the pleasant meals together, the friends, the interesting trips—have nothing to do with spirituality! These are only accompanying factors that are meant to bring out the points of friction which are most important. In your ordinary life you get married, you build a family, work, and do everything, and you live in the group, work with your friends, pay maaser, and participate in all the events. But in certain states you suddenly get stuck and cannot agree and cannot leap over them. At the same time, however, you take the right side or the left side without any problems. Of course, you don’t have a problem, since your ego agrees with everything that happens there. You should only identify the place where there can be a door, an opening and an entrance. It is there where it hurts the most! You don’t want to evoke these points since this is where you feel the real friction, like a painful injection. You are with everyone in your feelings and your mind! You love to study, to discuss spiritual matters, you love to spend time with the friends, you give them presents, you “buy the friends,” you invite them over. But sometimes it seems that when it comes to certain matters the group makes wrong decisions. You don’t object but wait quietly until the friends will finally grow up and understand their mistakes and correct them, which means, that they will agree with you. You understand that there is no alternative and nowhere to go since you admit that it is a wonderful, great, smart group and that nothing compares to it. It is a very common attitude that is typical of most students, but gradually, after several years of study, you begin to feel and see these points of friction in which you get stuck. It is there, in these points, where the entrance that is about to open is. It isn’t a door but a wall, but by working in faith above reason, you will see a door in this wall that will immediately open up and become an opening and an entrance. The entrance can only be in these points of friction and they are what you should look for and differentiate from everything else! Everything else is under the control of your ego. Only in these points of friction can there be the opening to another dimension by the power of faith. My Comment: The ideas of revolution and socialism have always been close to the French. But, on the other hand, it is in France that we see indifference to the ideas of integral education and upbringing, not to mention Kabbalah. Perhaps, in contrast to the Russian people, it is inherent in the specificity of the French revolution and in general in the French character. Question: It is said a thousand enter a room and only some are honored with the discovery of the Creator. Therefore I am overcome by fear, do I have the potential to discover the Reshimot? On the one hand, I understand that spiritual work is a great benefit and at the same time I cannot be released from the fear. How must one work with this? Answer: We know that hundreds of millions of people want to be rich, famous, and in control. How many of them attain that goal? The spiritual goal is compulsory for all. The expression that a thousand enter a room and only one attains the goal belongs to the Kabbalists from the previous generations. In those times it wasn’t required that everyone attain the spiritual worlds and those individuals who merited this acted according to very complex laws. They had to maintain very rigid and difficult conditions in order to enter the upper world. In our day, every housewife, every simple guy from South America, from Siberia, from Israel, from the United States, and from other regions can attain this without any preparation; the desire simply ignites within them and this is everything. We are entering a state like this where everyone without exception must advance to the goal. We even turn to those who don’t have this desire, in order to awaken it in them and prevent forward advancement under the influence of suffering because the world is already in a threatening state; we see where everything is advancing. Therefore the condition in which, “a thousand enter and one goes out” is not relevant for us. Today everyone must go out into the spiritual world even those who have not yet entered, not to mention those who are like us. Today this condition doesn’t work, forget it. The Kabbalists simply reminded us of that to spur us on a little bit, for in spite of it all, one must relate to this very seriously. This is within our power. The Kabbalists are apparently telling us, act in those frameworks in which you can and then you will succeed. This is saying that you must dedicate all of your spare time to inner work. At least it’s necessary to try to direct our intention to this all the time. Question: A person comes to study when he is an adult with an existing perspective of life. So he partly agrees with what he hears from the teacher and carries it out and he partly disagrees. Can he develop spiritually with such split feelings? Answer: It is natural for a person who hasn’t yet felt the spiritual world, and so because of this, he doesn’t see it in the teacher. It says “one judges by his own flaws.” So you see the corruptions in the teacher according to your own corruption. Here you need the power of the group to speak to you and convince you that the teacher is great and important. If you respect and value the friends and work with them, you will be able to overcome your feeling of disrespect by the power of the group. This disrespect is natural and logical, and it cannot be any other way. It was given to you on purpose from above, but at the same time you were given a tool, a means from above by which you can overcome it. You have to get closer to the group and through the group get closer to the Creator. This is why this order of work is arranged for you. But if it doesn’t work out, the problem is not that you disrespect the teacher. It is natural to disrespect him. The point is that you disrespect the group! You cannot connect to the friends in order to receive the power by which you can break through all the barriers. You need to overcome the egoistic rejection of the friends to some extent: Start getting closer to them during meals that you have together, while singing, and in different pleasant moments. Start from a distance from your ego so it feels it’s worthwhile to be with the friends. You were given a chance to receive power from the group and by that to adhere to the teacher, and through the teacher to adhere to the Creator, and thus gradually receive the Light that Reforms. It is natural for your ego to instinctively object to everything that the teacher says. Only a fool doesn’t object since he doesn’t understand where he is. Your nature rejects the Creator, as it says: “A person’s inclination is evil from his youth,” and so you are opposite from the spiritual work and from the teacher; you are opposite from the inner essence of the group, but the group has an external form too by which you can gradually get close to it. The greatest difficulty is that a person doesn’t perceive the group as a means that allows him to connect with the friends in order to adhere to the teacher together. The teacher will connect you all with the Creator. We don’t have to turn into Hasidim, but you do have to feel that you are small compared to the teacher, just like a person has to feel that he is small compared to the group and all the more so compared to the Creator. Start managing and arranging things by using all the means that you were given in this world and put them in the right order: This is me, this is the group, this is the study, and this is the teacher. Everything else is unknown because it comes from the Creator, but this is your entrance to Holiness, where you suddenly see a door that immediately becomes an opening and you enter. If you don’t fulfill this condition, nothing will work out. A person has to depict this to himself, even draw it and write it, and then continue and correct it every day. So you should clarify this question more and more, day by day, until you fulfill everything. You should understand that it is about clear and accurate laws. If you don’t keep them, then you can go not only through this life but through the next couple of lives too. No matter how many times you return to this world, it will still be the same. The spiritual Reshimot (reminiscences) are not fulfilled on every level unless it goes through these special conditions! Everything works according to certain laws in nature. It is because of our lack of understanding that we may think that there is no law here, but wherever we can discover it, we see that “He has given a law that cannot be broken.” We have to understand this, to learn these laws and keep them. Our ego doesn’t agree to that, but we can rise above it a bit. Why should we wait for the sufferings to force us to get away from our ego? It is better to do it of our own will, by our mind, which means by acquiring the values from the group. The group will help us keep away from our egoistic mind and will draw the Light that Reforms unto us that will build a new scale of priorities and different ways of thinking. Question: If in my daily life a small desire to direct my intention to bestow to the Creator appears and then quickly disappears, what can I do in order to focus on it? How can I help myself, should I draw something on my hand, or do something else? Answer: You remind me of those years when I was learning with Rabash. I also drew a symbol on my hand so that I would not forget the intention. When I was sitting behind the steering wheel in the car, the symbol on my hand was constantly flashing before my eyes, as if to remind me that I must think about the intention in order to bestow. This is so unnatural for us such that it cannot appear in a person’s head without some kind of external reminder. So do everything possible: draw something on your hand, set an alarm clock, and activate some signal on the cell phone so that every five minutes it will remind you about the intention. It’s not important which actions you do, they could be very different. The main thing is not to interrupt them; rather, just simply go back to control the intention. The moment that you prefer it you will feel a difference between our world and the spiritual world, because only the intention differentiates us from the spiritual world. The moment that some inclination appears within you, you will immediately feel that you are entering into a completely different matrix of sensations; you will begin to feel the world differently. It will suddenly begin to be like in a movie and then an absolutely different picture will appear.